Isn't it great!? 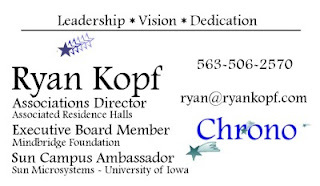 I am now, officially, the Sun Campus Ambassador in charge of the University of Iowa. Essentially, I'm sorta like a community organizer - I will be organizing people at the University of Iowa to get involved with and join the Open Source community. I'll be organizing lectures, workshops, and labs about Open Source software and products, giving demonstrations, and hopefully growing a community of like-minded students who appreciate Open Source. Also, I'm a Board Member-elect of the Mindbridge Foundation. I will be continuing to work with Mindbridge to develop our events more fully, and to focus on implementing new technology and developing long-term efficiency creating and cost-saving strategies.